Sunday, September 23 will mark the 38 year anniversary of an unidentified female found bound and murdered in the Calumet Sag Channel(sometimes incorrectly listed as ‘canal’ which is a different section of the system) in Alsip, Illinois. On September 23, 1980, an Illinois Tollway maintenance worker spotted the body in the Calumet Sag Channel near Alsip. When her body was recovered her hands were bound and she had sustained multiple stab wounds to her body. The Cook County Medical Examiner’s office estimates that she was deceased less than a week at the time of discovery in the channel. 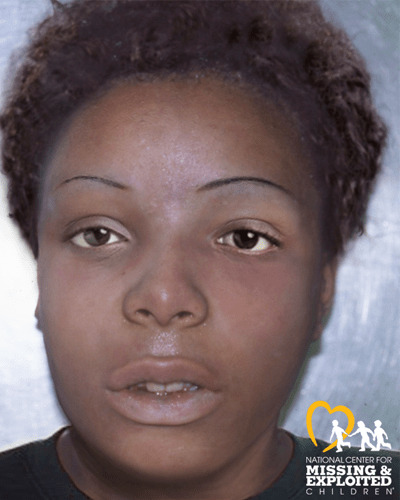 At the time of death, the unidentified black female is estimated to be between 17 and 25 years-old. She is about 5’6″ tall, weighing 133 lbs. She had brown eyes and short curly black hair that had a slight reddish tint at the time of her death, believed to be from hair dye. There was a red/pink pick style comb in her hair. At the time of death she was wearing a navy blue zip-up style sweater with possible floral pattern, tan bra and a dark blue or black sweater underneath. She had a silver ring on the ring finger of her left hand. A gold crescent shaped earring was in her right ear and a gold spade shaped earring in her left ear. Above photo is the jewelry worn by the victim when her body was recovered from the Calumet Sag Channel. She was wearing the silver ring on the ring finger of her left hand, along with gold earrings- one in each ear. Police located and recovered to sponge hair rollers near her body and do believe that she was either wearing them when she was dumped in the channel or they had been disposed of along with her. If you have any information about the identity of the young woman who was taken from us too soon, please call Cook Co. Medical Examiner’s Office at (312) 997-4500. If you believe you have information in relation to a crime that occurred around Tuesday, September 23, 1980, with a victim of similar description or heard someone brag or express remorse of a crime of similar circumstance please call Illinois State Police Zone 1 Investigations at (847) 608-3200. You are not required to leave your name. Remember somewhere out there, for almost forty-years a family has been missing a daughter, sister and quite possibly a mother. They deserve closure and she has a name. Should you have any information, do not hesitate to call! A lot of info and attention to detail.